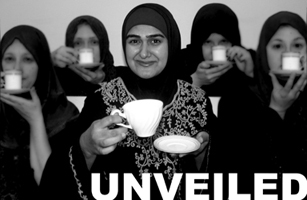 Five Muslim women in a post-9/11 world serve tea and uncover what lies beneath the veil in this critically acclaimed one-woman show. UNVEILED, a one woman play written and performed by Rohina Malik, has been presented at theaters in the United States, Canada and in the summer of 2016, South Africa. Rohina has performed the play at the 16th Street Theater, Victory Gardens Theater, Next Theater, Brava Theater, Crossroads Theater, Muslim Fest in Canada, Theater project, Baltimore, Voyage Theater Company NYC and Silk Road Rising. Unveiled has also been presented at Princeton University, Yale University, NYU, University of Chicago, Stanford University, DePaul University, Loyola University, College of the Atlantic, Bates College, St. Mary's College, UC Irvine, UC Santa Barbara, UC Davis, Oklahoma State University, University of Wyoming, Brigham Young University, College of New Jersey, Washington University, Fordham University, UW Osh Kosh, Concordia University, La Verne University, and many more. Rohina has been invited to perform UNVEILED at Universities, Churches, Mosques, Synagogues and Theaters. She was awarded the Y award with the Evanston YWCA for her work to end racism. "Rohina Malik, the hugely talented writer-actress at the center of the Victory Gardens solo show "Unveiled," is a remarkable new theatrical voice in Chicago. In her rich, upbeat and very enjoyable 70-minute collection of five character studies of Muslim women in modern-day America, Malik gives voice to characters from whom we hear far too little in the theater." A "terrific show... intellectually engrossing work of theater"
"Unveiled offers a provocative, insightful and uplifting theater experience." "Powerful solo show... five riveting tales of Muslim women"
“A compelling 70-minute piece rich with illuminating surprises, drawing the audience into worlds that are both unique and truly universal. It is terrifically entertaining. "Rohina's little masterpiece will further open our eyes"
"The stories are important, to be sure, but the cumulative effect is weighty." --Web Behrens, Chicago Free Press.